Wheatgrass and Green Smoothies... WOW! - Got Greens? Wheatgrass and Green Smoothies… WOW! 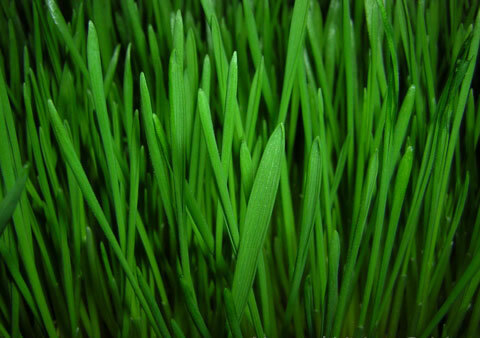 Wow… I can’t believe how much I really enjoy wheatgrass. I have enjoyed wheatgrass shots from time to time for a while now. When I indulge I love them. I usually take a double and I don’t understand why anyone would want a chaser of juice. But my love for wheatgrass has been growing to a new level. About a month ago I started wanting more wheatgrass in my diet and was ecstatic when I found I could buy it by the pound fresh cut from a local farm. I began adding it to every green smoothie I made. 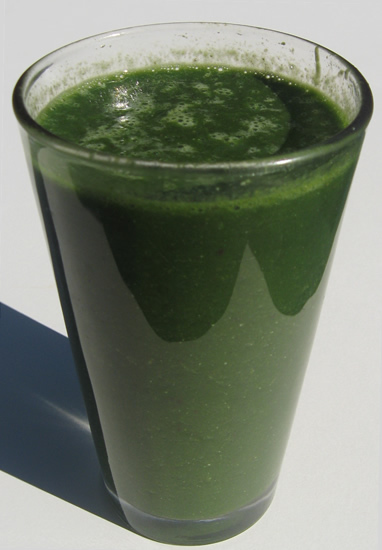 You can make green smoothies with wheatgrass! I recalled from the past when I put the entire grass in the Vita-Mix that it resulted in grassy gobs that were less than pleasant. So I resorted to cutting the wheatgrass into 1/4 to 1/2 inch pieces with my kitchen scissors or else fine chopped it on a cutting board. This works great. Wheatgrass adds a fantastic creamy sweetness to green smoothies – similar to romaine and banana. I really can not recommend adding wheatgrass to your smoothie enough! So… what do you do with your wheatgrass? We hunger for more recipes.